Switching devices — The converter is modeled with IGBT/diode pairs controlled by firing pulses produced by a PWM generator. This model provides the most accurate simulation results. Switching function — The converter is modeled by a switching-function model. The switches are replaced with two voltage sources and two diodes on the AC side and with two current sources on the DC side. 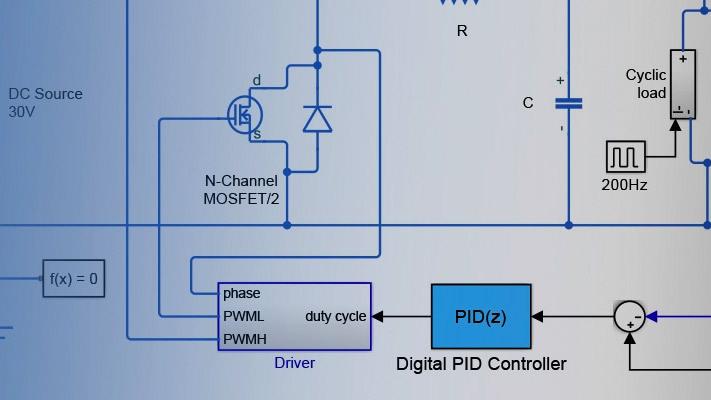 The converter is controlled by firing pulses produced by a PWM generator (0/1 signals) or by firing pulses averaged over a specified period (PWM averaging: signals between 0 and 1). Both modes of operation produce harmonics normally generated by a PWM-controlled converter and also correctly simulate rectifying operation as well as blanking time. This model type is well-suited for real-time simulation. Average model (D-controlled) — The converter is modeled using a switching-function model directly controlled by the duty cycle signal (0 < D < 1). A PWM generator is not required. This model provides the fastest simulations. Internal resistance of the switching devices, in ohms. This parameter is available only when you set the Model type parameter to Switching devices. The default value is 1e-3. The snubber resistance, in ohms. Set the snubber resistance to inf to eliminate the snubbers. This parameter is available only when you set the Model type parameter to Switching devices. The default value is 1e6. The snubber capacitance, in farads. Set the snubber capacitance to 0 to eliminate the snubbers. This parameter is available only when you set the Model type parameter to Switching devices. The default value is inf. The forward voltage of the switching device and of the diode, in volts. This parameter is available only when you set the Model type parameter to Switching devices. The default value is [0,0]. Internal resistance of the diodes, in ohms. This parameter is available only when you set the Model type parameter to Switching function or Average model (D-controlled). The default value is 1e-3. The snubber resistance, in ohms. Set the snubber resistance to inf to eliminate the snubbers. This parameter is available only when you set the Model type parameter to Switching function or Average model (D-controlled). The default value is 1e6. The snubber capacitance in farads. Set the snubber capacitance to 0 to eliminate the snubbers. This parameter is available only when you set the Model type parameter to Switching function or Average model (D-controlled). The default value is inf. Forward voltage, in volts, across the diode when it is conducting. This parameter is available only when you set the Model type parameter to Switching function or Average model (D-controlled). The default value is 1e-3. The snubber resistance, in ohms, across the two current sources. Set the snubber resistance to inf to eliminate the snubbers. This parameter is available only when you set the Model type parameter to Switching function or Average model (D-controlled). The default value is inf. The firing pulse signal to control the converter. This port is visible only when you set the Model type parameter to Switching devices or Switching function. The duty cycle signal (a value between 0 and 1) used to control the converter. This port is visible only when you set the Model type parameter to Average model (D-controlled). You can block all firing pulses to the converter by applying a signal value of 1 at the BL input. See the Power Converters Modeling Techniques example for a comparison of the three converter modeling techniques.